Paul Weller At The Haiti Earthquake Fundraiser! – Paul Weller News! Paul Weller At The Haiti Earthquake Fundraiser! Last night’s benefit concert for the victims of the Haiti earthquake wasn’t the music industry’s fastest response to the disaster. For that, we must cede grudging respect to Simon Cowell’s reinvention of Everybody Hurts. This hastily organised show, featuring Paul Weller, Mr Hudson, Seasick Steve, Futureheads and KT Tunstall, no doubt appealed to music fans resistant to Cowell’s pan-celebrity pop fondue who wanted to empty their pockets into the donation buckets. An altogether different kind of charity was needed to deal with the sight of The Humans (featuring Toyah Willcox and her husband Robert Fripp) playing a succession of songs so uniformly awful that the applause they elicited stemmed from the realisation that mere silence would simply heighten the sense of communal embarrassment. The fast-moving nature of this benefit meant that necessity begat invention. On the face of it, an acoustic set by the angular Tyneside art-poppers The Futureheads didn’t show promise, but a spirited blitz through the new single Heartbeat Song and Kate Bush’s Hounds of Love showed a warmth dormant in their songs. Flourishing in the face of similar restrictions, Kanye West’s favourite British songwriter Mr Hudson ditched the synths and autotune for guitar, navigating his way to a kettledrum-denting climax on Supernova. Yet for all the good intentions willing this to be an unforgettable night, the evening needed an injection of intensity to nudge the atmosphere beyond mere conviviality. The attributes that have propelled KT Tunstall to this point in her career – the blithe, sisterly bonhomie that pervaded Black Horse and The Cherry Tree and a new song called Greenland – were somewhat surplus to requirements on the night. No such problem with Paul Weller, of course. At 51, the Modfather has little to prove – not least on a bill where his name was perhaps the biggest draw. All told, the task of following Weller was best left to a performer with even more experience. Few would have said, in all honesty that the itinerant Mississippi bluesman Seasick Steve emulated what had gone before him. But as a cockle-warming close to an at times extraordinary evening, the short set was hard to fault. “That was a three-string guitar that suddenly turned into a two-string guitar” he joked at the end of Thunderbird. Then, on Never Go West, he celebrated a genre that, in less skilled hands, would have seemed drowned in the aspic of pastiche. A spine-tingling climax to a night of eclectic mayhem. Previous Entry Paul Weller’s NME Awards Backstage Interview! 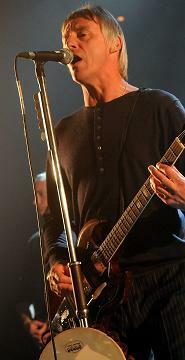 Next Entry Paul Weller’s Short Interview For Absolute Radio At The NME Awards!